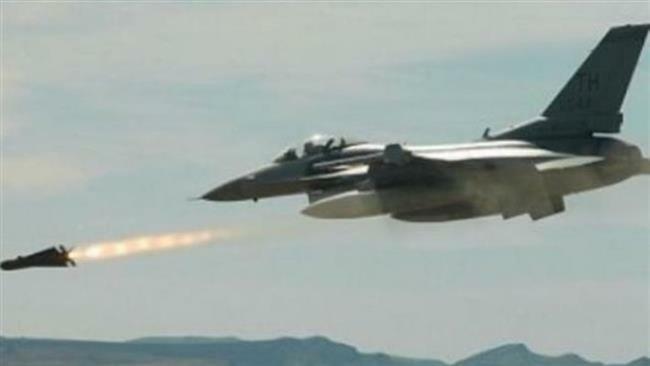 Home Tags Posts tagged with "Gaza Strip"
Israel’s jet fighters have hit two Palestinian targets in the Gaza Strip. The Israeli military said the targets were Hamas weapon manufacturing facilities, adding that the strikes were in response to two rockets fired from Gaza into southern Israel. A pregnant woman and her young daughter in a nearby house were killed, Palestinian officials said. In the West Bank, Israeli police say a Palestinian woman set off a car bomb at a checkpoint. The woman was stopped by police while driving on Sunday morning near the Israeli settlement of Maale Adumim. She “shouted <<Allahu Akbar>> [God is great] and detonated an explosive device”, a police spokeswoman said, adding that the woman was in critical condition and a policeman was slightly wounded. Initial reports had said the woman had died in the blast. “The IDF holds Hamas responsible for any act of aggression from the Gaza Strip,” said Israel Defense Forces’ spokesman Lt Col Peter Lerner in a statement following the airstrikes on October 11. As well as the two reported deaths, medical staff in the Zeitun sector, south of Gaza City, say three people are trapped in the rubble of the destroyed house. There have been weeks of tension over access to a site in East Jerusalem sacred to both Jews and Muslims. Palestinians fear Israel plans to change arrangements at the al-Aqsa mosque/Temple Mount compound, where Jews are allowed to visit but not allowed to pray – something Israel insists it will continue. Earlier, Secretary of State John Kerry expressed “deep concern” over the situation. John Kerry made separate phone calls to Israeli Prime Minister Benjamin Netanyahu and Palestinian Authority President Mahmoud Abbas. In his phone calls earlier John Kerry “stressed the importance of upholding the status quo in word and deed” at the site, the state department said. He offered his support in efforts to restore calm, but both men blamed the other side for the rising violence. Benjamin Netanyahu “made it clear that he expects the PA [Palestinian Authority] to stop its wild and mendacious incitement, which is causing the current wave of terrorism”, his Twitter account said. Mahmoud Abbas told John Kerry that Israel should stop settler “provocations”, which he said were carried out under Israeli army protection, his office said. Israel and Hamas have agreed a long-term ceasefire in the Gaza Strip. The truce, ending seven weeks of fighting that has left more than 2,200 people – mostly Palestinians – dead, was brokered by Egypt and began at 19:00 local time. Hamas said the deal represented a “victory for the resistance”. Israel is to ease its blockade of Gaza to allow in aid and building materials, Israeli officials said. Indirect talks on more contentious issues, including Israel’s call for militant groups in Gaza to disarm, will begin in Cairo within a month. UN Secretary General Ban Ki-moon also welcomed the truce. But in a statement via his spokesman, Ban Ki-moon warned that “any peace effort that does not tackle the root causes of the crisis will do little more than set the stage for the next cycle of violence”. The breakthrough came as both Israel and the Palestinians continued to trade fire. A last-minute volley of mortar shells from Gaza killed an Israeli civilian and wounded six others in Eshkol Regional Council. Earlier on Tuesday, at least six Palestinians were killed in a series of Israeli air strikes in Gaza, Palestinian officials said. Palestinian officials said Egypt’s cease fire proposal called for an indefinite end to hostilities, the immediate opening of Gaza’s crossings with Israel and Egypt, and an extension of the territory’s Mediterranean fishing zone. A month later Israel and the Palestinian factions would discuss the construction of a seaport and airport in Gaza and the freeing of about 100 prisoners. Israel and Egypt were also said to be demanding guarantees that weapons would not be smuggled into Gaza. The announcement was greeted by celebratory gunfire on the streets of Gaza City. However, sirens warning of rockets reportedly continued to sound in southern Israel. Israel launched Operation Protective Edge on July 8 with the stated aim of ending rocket fire. It was later expanded to include the destruction of tunnels used by militants for cross-border attacks. At least 2,140 people, most of them civilians, have been killed in Gaza, according to the Palestinian health ministry. The Israeli authorities say 64 Israeli soldiers have been killed, along with three Israeli civilians and a Thai national. Early on Tuesday, Israeli jets bombed two high-rise buildings in Gaza City, containing flats and offices. No-one was reported killed as residents managed to flee both buildings after the Israeli military warned them to leave. Hamas, citing Palestinian casualties, has accused Israel of an “unprecedented act of revenge” against civilians. However, Israeli military spokesman Lt Col Peter Lerner told the Associated Press the strikes were “a direct result of Hamas’ decision to situate their terrorist infrastructure within the civilian sphere, including schools, hospitals and high-rise buildings”. Hamas military commander Mohammed Deif’s wife and son have been killed in an Israeli airstrike on the Gaza Strip. At least 19 Palestinians have died since hostilities resumed on August 19, with both sides blaming each other for the collapse of the Cairo peace talks. The Israeli military said it had carried out 92 air strikes in response to 137 rockets fired at its territory. Six weeks of fierce fighting have left at least 2,103 people dead. Egypt has expressed “profound regret” at the end of the 10-day period of calm and said it will continue trying to secure a lasting truce. 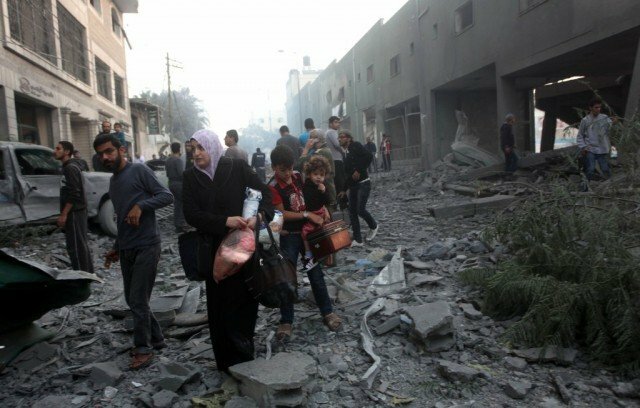 It is believed the air strike on a house in Gaza City late on August 19 that killed Mohammed Deif’s wife and their young son was intended to kill the militant himself. The commander of Hamas’ armed wing, the Izz al-Din al-Qassam Brigades, has survived a number of previous Israeli assassination attempts believed to have left him with severe disabilities. Israeli Interior Minister Gideon Saar said the attack was justified because Mohammed Deif was “personally responsible” for dozens of deaths. Yaakov Perry, Israel’s science minister and former security service chief, said he was “convinced that if there was intelligence that Mohammed Deif was not inside the home, then we would not have bombed it”. Rescue workers later pulled out of the remains of the house the bodies of three members of the family that lived there, medics said. Another air strike early on Wednesday killed eight people, including a heavily-pregnant woman and three children, in the central Gaza town of Deir al-Balah, emergency services spokesman Ashraf al-Qudra told the AFP news agency. Later, a man and child were killed in Zeitoun in southern Gaza City, and two militants died when a missile hit their motorcycle in the northern town of Beit Lahiya, Mr Qudra added. The IDF said it had targeted two militants responsible for launching rockets in the area. The apparent attempt to kill Mohammed Deif may explain the intensity of the rocket fire that came after the collapse of the Cairo peace talks. Air-raid sirens sounded in many towns and cities in southern and central Israel, including Tel Aviv and Jerusalem, as 50 rockets were launched on August 19 and 30 on August 20. One hit a home in the Hof Ashkelon region, but no injuries were reported. Israel’s Iron Dome anti-missile system has shot down a number of incoming rockets, but the Israeli authorities have ordered the re-opening of bomb shelters within 50 miles of Gaza. Palestinian negotiators blamed Israel for the failure of the indirect talks. “Israel thwarted the contacts that could have brought peace,” said Azzam al-Ahmed, a senior member of the Fatah movement of Palestinian Authority President Mahmoud Abbas. However, Israeli government spokesman Mark Regev rejected the accusation. “The Cairo process was built on a total and complete cessation of all hostilities and so when rockets were fired from Gaza, not only was it a clear violation of the ceasefire but it also destroyed the premise upon which the talks were based,” he told the Reuters news agency. Israel has been seeking guarantees that Hamas and other factions in Gaza would be disarmed, while the Palestinians were demanding an end to the Israeli and Egyptian blockades of Gaza, and the establishment of a seaport and airport. UN Secretary General Ban Ki-moon said he was “gravely disappointed by the return to hostilities”. Israel launched Operation Protective Edge on July 8 with the aim of ending rocket fire. It also sought to destroy tunnels dug under the frontier with Israel used by militants to launch attack. Since then, at least 2,036 people, most of them civilians, have been killed in Gaza, according to the Palestinian health ministry. The Israeli authorities say 64 Israeli soldiers have been killed, along with two Israeli civilians and a Thai national. Israel has announced a seven-hour humanitarian ceasefire in parts of Gaza. A senior Israeli military official said the truce would not apply to the town of Rafah and that Israeli troops would respond if they were attacked. Earlier, UN chief Ban Ki-moon described an Israeli strike near a UN-run school in Gaza as “a moral outrage and a criminal act”. The Israel Defense Forces (IDF) confirmed on Sunday that they had begun withdrawing some troops from Gaza, saying it was “extremely close” to completing its mission to destroy a network of tunnels. In the outrage that followed Sunday’s attack on the UN school, Israel announced it would hold a “humanitarian window” in its Gaza offensive to allow hundreds of thousands of displaced Palestinians to return to their homes. The ceasefire would not include Rafah because there was an “Israeli military presence” there and “clashes were still ongoing”, an IDF statement said. It said the truce would last from 10:00 local time until 17:00. The Israeli army warned that it would “respond to any attempt to exploit this window” by Islamist militants in Gaza. Hamas responded to the truce with suspicion and its spokesman, Sami Abu Zuhri, accused the IDF of attempting to “divert the attention from Israeli massacres”. Israeli air strikes on Gaza and Palestinian militant rocket fire launched at Israel continued on Monday morning ahead of the planned ceasefire. The Islamic Jihad group said its commander in northern Gaza, Daniel Mansour, died when Israeli forces struck his home just before dawn. 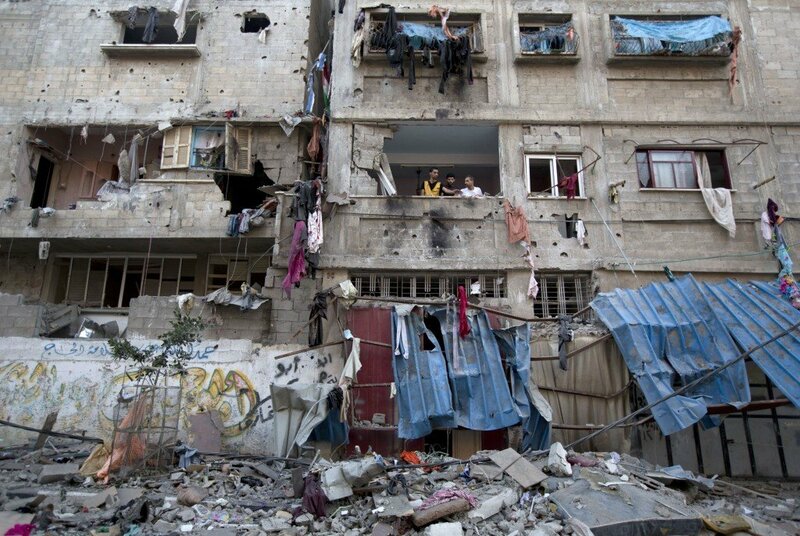 More than a quarter of the 1.8 million residents in the Palestinian territory have been displaced. Many of those who have fled their homes have taken refuge in UN shelters across Gaza, including the UN-run school in Rafah which was hit on Sunday. The IDF said it had targeted three Islamist militants near the school. Ban Ki-moon described the attack as “yet another gross violation of international humanitarian law”, adding that Israel had regularly been informed of the precise location of the school. State Department spokeswoman Jen Psaki said the US was appalled by the “disgraceful shelling”. Israel said it was investigating the incident. PM Benjamin Netanyahu said Israel was “sorry for any attack that unintentionally hits civilians”, but accused Hamas of turning UN facilities into “terrorist hotspots”. “Hamas has an interest in Gaza residents suffering, thinking that the world will blame Israel for their suffering,” Benjamin Netanyahu said in a statement on Monday. The IDF says 2,560 rockets and mortars fired from Gaza have landed in Israel since 8 July, with its Iron Dome defense system having intercepted another 556 rockets. Hadar Goldin, the Israeli soldier reported missing in Gaza on Friday, is dead, Israel’s military says. Hadar Goldin was believed to have been captured by militants during fighting, leading to the collapse of a ceasefire shortly after it had been declared. The Israel Defense Forces (IDF) said it had determined that Lt. Hadar Goldin had died. Israeli PM Benjamin Netanyahu has said the operation in Gaza will continue until it restores security to Israeli citizens. AFP news agency quoted Palestinian emergency services as saying 12 Palestinians had been killed early on Sunday but this has not been independently confirmed. Israeli media also reported fresh militant rocket attacks. 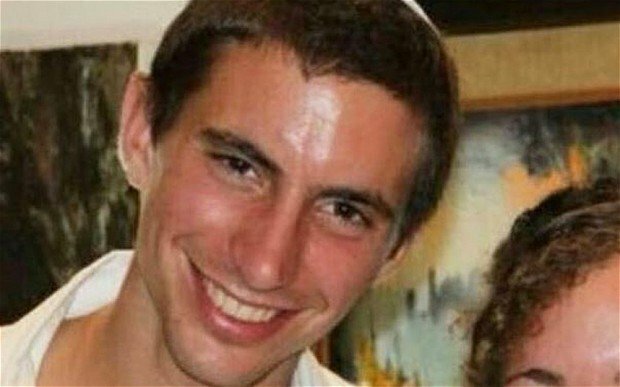 Hamas had denied it was holding the 23-year-old Hadar Goldin captive, saying it did not know the soldier’s whereabouts. The military wing of the Islamist group said it had lost contact with some fighters in the area where Israel said the soldier had been seized. It said it believed the fighters and possibly Hadar Goldin had been killed in an Israeli airstrike. Israel’s defense minister and the chief military rabbi met the soldier’s family at their home in the town of Kfar Saba on Saturday night. Hundreds of well-wishers had gathered outside their home and there was an outpouring of grief when the military’s announcement was made public. Confirmation of Lt. Hadar Goldin’s death means 66 Israelis have now died in the fighting, all but two of them soldiers. A Thai worker in Israel also died. Some 1,700 Palestinians, mostly civilians, have been killed since the conflict began more than three weeks ago. Earlier, PM Benjamin Netanyahu vowed to continue the Israeli offensive in Gaza until “we achieve our objective of restoring security to you, Israeli’s citizens”. “Hamas again mistakenly believes that the people of Israel do not have the will and determination to fight them and Hamas again will learn the hard way that Israel will do whatever it must do to protect its people,” he said. The Islamist group would pay an “intolerable price” for attacks on Israel, Benjamin Netanyahu added. Hamas spokesman Fawzi Barhoum dismissed Benjamin Netanyahu’s comments as “confused” and said the group would “continue to resist until we achieve our goals”. Meanwhile, a UN spokesman in Gaza has warned that a “health disaster of widespread proportions is rapidly unfolding” there after three weeks of intense conflict. Chris Gunness from the United Nations Relief and Works Agency (UNRWA) says Gaza’s medical services are “on the verge of collapse”. “At least half of all public health primary care clinics in Gaza are closed,” he said, adding that the medical facilities still functioning are overwhelmed. Chris Gunness also warned that there was a serious risk of an outbreak of waterborne and communicable diseases because of a lack of adequate water and poor sanitation. Israeli forces say one of its soldiers is believed captured, as a 72-hour truce with Hamas in Gaza collapsed just hours after it had begun. The soldier, named as Hadar Goldin, 23, disappeared when Israeli forces trying to destroy a suspected militant tunnel were attacked, Israel’s military said. Two soldiers died in firefight in southern Gaza Strip at 9:30 local time. The Gaza health ministry said dozens were killed by Israeli shelling in the area shortly after the incident. 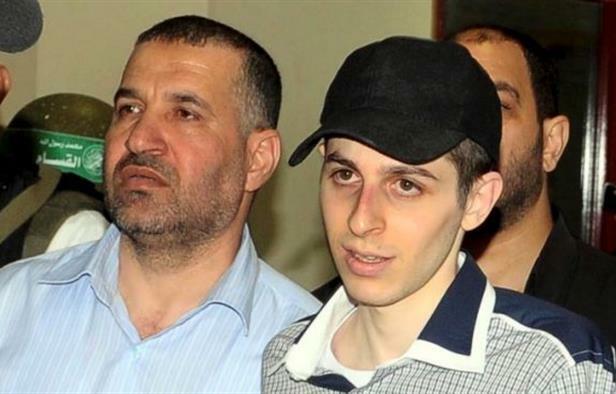 In 2006 Palestinian militants captured Israeli soldier Gilad Shalit and held him for five years. Gilad Shalit was released in November 2011 in exchange for 1,000 Palestinian prisoners. Hamas has not confirmed or denied capturing a soldier. Some 1,460 Palestinians, mostly civilians, have died in the latest conflict and 63 Israelis, mostly soldiers. The ceasefire had been brokered by the US and UN to give civilians a reprieve from the violence, and had been seen as an unforeseen breakthrough after days of diplomatic deadlock. Also on Friday, Palestinian and Israeli delegations arrived in Cairo, Egypt, with the hope of negotiating a longer-term cessation of hostilities, but Egyptian officials said the talks had now been postponed. A senior Israeli official said Hamas had breached the ceasefire and Israel’s response would be “crushing”. Another Hamas official said the announcement of the soldier’s capture was “a justification for Israel retreating from the truth and a cover-up for massacres”. Palestinian media reported that Hamas had called for a “day of anger” across the West Bank. Israel’s military is resuming its operations in Gaza, saying Hamas broke planned 72-hour ceasefire just hours after it had begun. The army said it had warned residents to stay indoors. Palestinian sources said at least 27 people had been killed in an Israeli attack in Gaza. Israel said it was in response to rocket fire from Hamas. Some 1,460 Palestinians, mostly civilians, have died in the conflict and 63 Israelis, mostly soldiers. Palestinian and Israeli delegations have arrived in Cairo, Egypt, with the hope of negotiating a longer-term cessation of hostilities, but the fate of the talks now seems unclear. During the morning life appeared to be returning to some kind of normality in Gaza, with many Palestinians heading towards heavily shelled areas to see if their homes were still intact. But the Gaza health ministry reported that at least 27 Palestinians were killed and 100 injured in an Israeli attack near the southern town of Rafah after the ceasefire began. AFP news agency said the artillery barrage was continuing, preventing medics from recovering dead and wounded from the site. The US – Israel’s closest ally – has said the shelling of a UN shelter in Gaza is “totally unacceptable and totally indefensible”. In its strongest criticism yet of Israel’s offensive in the Palestinian territory, the US urged Israel to do more to protect civilian life. A quarter of Gaza’s population has been displaced by the fighting, the UN says. Israel says its operation in Gaza is designed to defend its population from attacks by Palestinian militants. It blames the Hamas militant group for most of the civilian deaths in Gaza, saying its fighters deliberately operate from civilian areas. The Israeli army has now “neutralized” 70-80% of Hamas’ offensive tunnel network into Israel. Israel says it will not stop its operation in Gaza until all the tunnels – which militants use to infiltrate Israeli territory – have been destroyed. Since Israel began its offensive in Gaza on July 8, 1,422 Palestinians have been killed and 8,265 injured, most of them civilians, according to Gaza’s health ministry. This means more Palestinians have now been killed than during Operation Cast Lead – the last time Israel launched a ground invasion in Gaza – in 2008-2009. Fifty-eight Israelis have been killed in total – 56 soldiers and two civilians. A Thai worker in Israel has also died. “There is a difference in approach between what Hamas is perpetrating on the Israeli people and what Israel is doing to defend their country,” White House spokesman Josh Earnest told reporters. He was referring to an incident on Wednesday, when at least 16 people were killed when shellfire hit a UN-run school designated as a civilian shelter in the Jabaliya district of Gaza City. 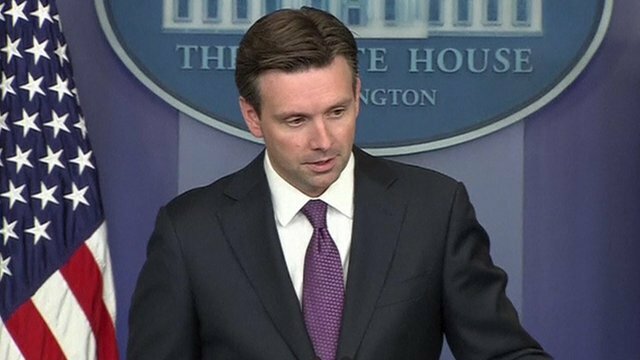 Josh Earnest said there was little doubt that the shells were fired by the Israeli military. The UN has also condemned the continuing violence. “The reality of Gaza today is that no place is safe,” UN humanitarian chief Baroness Valerie Amos told the Security Council. 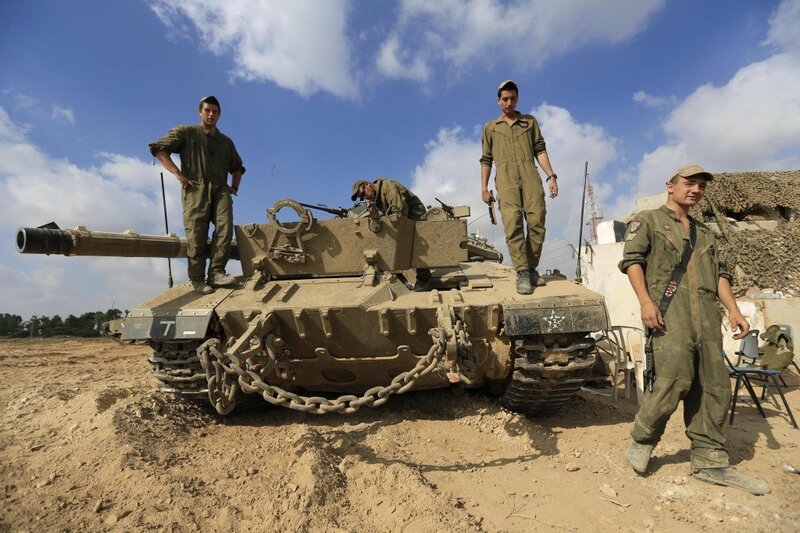 Israel has decided to call up 16,000 extra reservists to bolster its military as the conflict in Gaza continues. The deployment brings the total called up by Israel to 86,000. Officials told Israeli media the call-up gave the military “room to breathe”. The move comes as Israel pledged to investigate a strike on a UN-run school that killed at least 16 people. In all, more than 100 people in Gaza were killed on Wednesday, Palestinian officials said. The US and UN condemned the attack, with UN Secretary General Ban Ki-moon calling it “unjustifiable”. On Wednesday, Israel’s security cabinet met to approve the continuation of strikes against Palestinian militant group Hamas, which controls Gaza. Operations would continue against suspected militants, suspected rocket sites and a network of tunnels discovered leading into Israel, the military said. At least 19 air strikes were carried out overnight, officials said. Israel began Operation Protective Edge on July 8. Since then at least 1,360 Palestinians have been killed. Most have been civilians. Some 58 Israelis have been killed, 56 soldiers and two civilians. A Thai worker in Israel has also died. The attack on the school in the Jabaliya refugee camp, which was sheltering more than 3,000 civilians, took place on Wednesday morning. UN Secretary-General Ban Ki-moon said “all available evidence” suggested Israeli artillery was the cause. The US state department also criticized the attack on the school. It also condemned those who hid weapons in UN facilities, a spokeswoman said. Also on Wednesday, an attack on a market in Shejaiya killed 17 people, while an Israeli air strike killed seven people in Khan Younis, Palestinian officials said. Those attacks came during a four-hour humanitarian ceasefire called by the Israelis after the school incident. However, Israel said the truce was only partial. Hamas rejected it as meaningless. Israel said Palestinian militants continued to fire rockets from Gaza, with more than 50 launched on Wednesday. The current conflict, now in its 24th day, is the longest between Israel and militants from Gaza. At least 17 Palestinians have been killed and 160 wounded in an Israeli strike that hit a fruit and vegetable market in Shujayea, near Gaza City, during a “humanitarian pause” unilaterally announced by Israel. Hundreds of people were shopping in the market, a spokesman for the Gaza health ministry said. Hamas, which controls Gaza, had rejected the truce as meaningless. Meanwhile, Israel said three more of its soldiers had been killed in Gaza. Palestinian doctors also said that another Israeli air strike after the partial humanitarian ceasefire was announced had killed seven people in Khan Younis. Earlier, the UN said Israel had attacked a UN-run school housing refugees in Gaza, despite warnings that civilians were there. Fifteen people were killed and dozens hurt. The White House condemned the attack and said it was “extremely concerned” that Palestinians were not safe at shelters despite being told to evacuate their homes by Israel’s army. More than 1,300 Palestinians and 58 Israelis have now died in the conflict. Most of the Palestinian deaths have been of civilians. Fifty-six Israeli soldiers have been killed along with two civilians. A Thai worker in Israel has also died. The Israeli military said that the three soldiers killed on Wednesday died in a booby-trapped building. 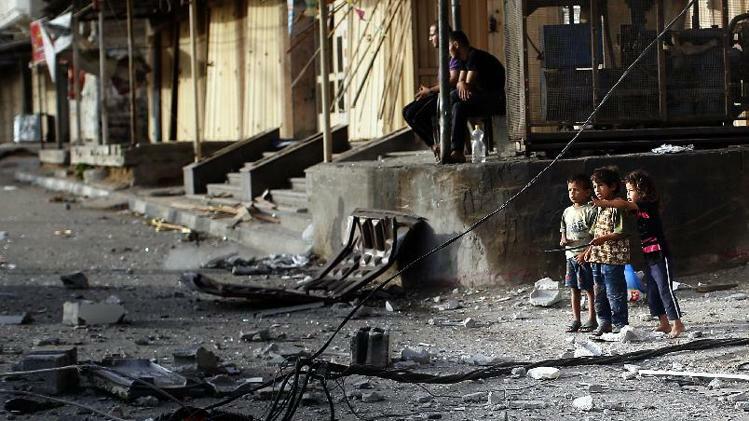 Correspondents say many people in Gaza were unaware the partial ceasefire had been called. Witnesses at the scene of the market strike in Shejaiya spoke of smoke billowing over the site, with ambulances racing victims to hospital. A journalist who worked for a local news agency was reported to have been killed. The Palestinian al-Aqsa satellite TV channel quoted Hamas spokesman Fawzi Barhum as saying that the market attack required “an earth-shattering response”. The Israeli military had said the ceasefire would last between 15:00 and 19:00. However, it had warned that the truce would only apply to areas where Israeli soldiers were not currently operating, and it told residents not to return to areas they had previously been asked to evacuate. Hamas spokesman Sami Abu Zuhri had rejected the truce as meaningless. “The lull which Israel announced is media exploitation and has no value because it excludes the volatile areas along the border, and we won’t be able to get the wounded out from those areas,” he said in a statement. Sirens continued to sound in southern Israel after the ceasefire, to warn of militant rocket attacks. Israel said more than 50 rockets were fired from Gaza on Wednesday. Israel attacked a UN school housing refugees in Gaza despite repeated warnings that civilians were sheltering there, the UN has said. UN spokesman Chris Gunness said “the world stands disgraced” by the attack, in which 15 were reported killed. The Israeli military said an initial inquiry suggested soldiers responded after militants had fired mortar shells “from the vicinity of the [UN] school”. Some 1,200 Palestinians and 55 Israelis have been killed in the conflict. Some 53 Israeli soldiers have been killed along with two civilians. A Thai worker in Israel has also died. Israel launched its offensive in Gaza after a surge in rocket fire from the territory. Hamas, which controls Gaza, says it will not stop fighting until the blockade, maintained by both Israel and Egypt, is lifted. The current conflict is now the longest between Israel and militants from Gaza. A 2012 offensive lasted for eight days, and the 2008 conflict went on for 22 days. Chris Gunness from the UN Relief and Works Agency (UNRWA) said that Israel had been told 17 times that the school in the Jabaliya refugee camp was housing the displaced. “The last time was hours before the fatal attack,” he said. He said there were “multiple deaths” including women and children, adding that the attack caused “universal shame”. Images from the school showed large holes in the walls and roof. Bob Turner, UNRWA’s Gaza director, said the UN was “confident” Israel was responsible. He said UN workers had collected fragments of projectiles that suggested they were artillery shells fired from Israeli positions to the north-east of the school. The Israeli military said the incident was under review. The military said in a statement that its “initial inquiry suggests that militants fired mortars earlier this morning from the vicinity of UNRWA school in Jebalia”. It said soldiers “responded by firing towards the origin of fire”. Israel has repeatedly accused Hamas of using schools and civilian areas as bases to launch attacks. Last week, another UN-run school was hit, with Palestinians saying at least 15 people were killed. But the Israeli military denied the killings, saying a single “errant” shell had landed in an empty courtyard. Israel stepped up the intensity of its strikes on Tuesday and overnight into Wednesday, saying it had hit a number of tunnels dug by militants to attack Israel. But the Israeli military said rockets continued to land in Israel from Gaza. Palestinian officials said Gaza’s port had been destroyed on Tuesday and its only power plant had been put out of action. Meanwhile, Palestinian factions Hamas, Fatah and Islamic Jihad are expected to meet in Cairo later to discuss a ceasefire. Israeli PM Benjamin Netanyahu has warned of a “prolonged” military campaign in Gaza, as it saw one of its heaviest nights of shelling since the conflict began. Benjamin Netanyahu said Israel would continue to act until it had achieved its aim of destroying militant group Hamas’s network of underground tunnels. 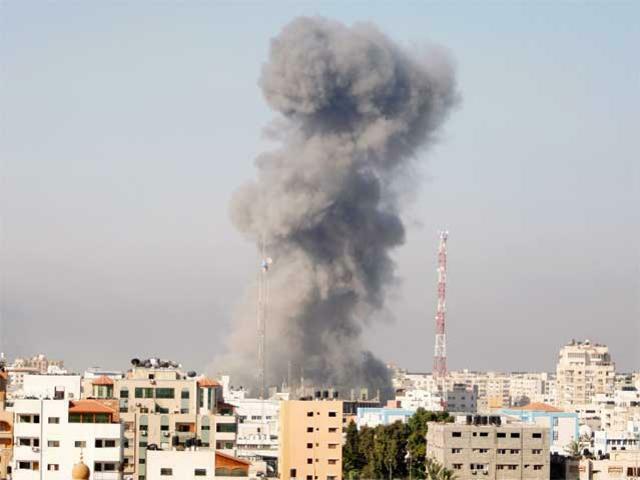 Israel made 60 air strikes on targets in Gaza overnight including TV stations and the house of a key Hamas leader. It said militants had launched three rockets at Israel. At least 13 Palestinians are reported to have been killed in the overnight attacks, including six victims in one house in the Bureji refugee camp, while Israel’s army lost 10 soldiers in the past 24 hours. 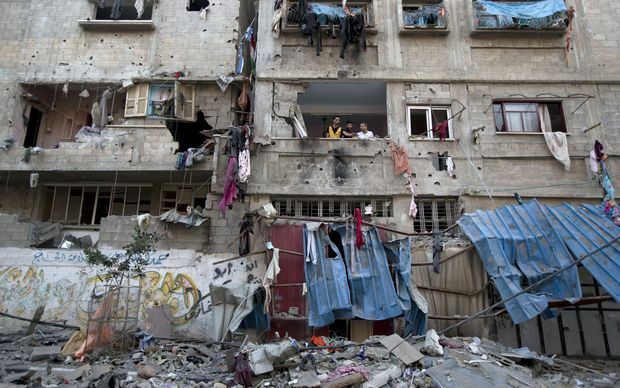 Officials say more than 1,100 Palestinians, most of them civilians, have been killed in the fighting since July 8. Israel says 53 of its soldiers and three civilians – two Israelis and a Thai worker, have been killed. Early on Tuesday, Israeli aircraft fired at the unoccupied house of former Hamas PM Ismail Haniyeh, while Hamas TV and radio stations were also hit. Three rockets were fired from Gaza, with one rocket successfully intercepted and two hitting open spaces in central Israel, Israel’s military said. At least 10 people – eight of them children – were killed in blasts in Gaza City on Monday afternoon, Palestinian health officials said. It is unclear if they were killed by an Israeli attack or a misfiring militant rocket. 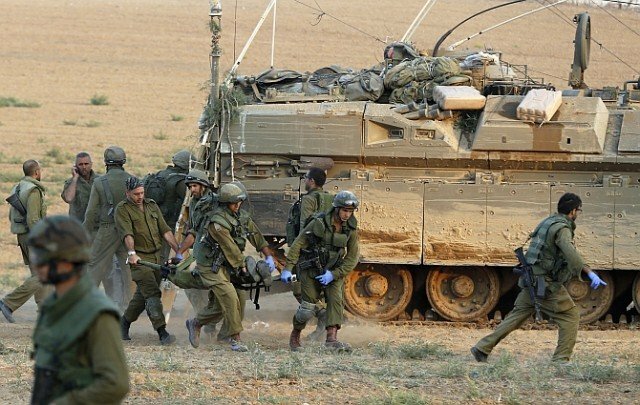 Five Israeli soldiers were killed on Monday when militants infiltrated the border, while a mortar bomb killed four earlier and a tenth died in a clash in southern Gaza, the Israel Defense Forces (IDF) said. Benjamin Netanyahu described Monday as a “painful day”. “We will continue to act aggressively and responsibly until the mission is completed to protect our citizens, soldiers and children,” he said. On Monday, UN Secretary General Ban Ki-moon criticized both sides for firing into civilian areas, and called for an immediate, unconditional humanitarian ceasefire in Gaza during the Muslim Eid al-Fitr holiday. His spokesman later added that Ban Ki-moon was concerned at reports that leaflets had been dropped by the IDF warning residents in the northern Gaza Strip to evacuate to Gaza City. “If true, this would have a further devastating humanitarian impact on the beleaguered civilians of those areas of the Gaza strip, who have already undergone immense suffering in recent days,” his spokesman said. Rocket fire and air strikes between the two sides increased after the abduction and killing of three Israeli teenagers in June, which Israel blamed on Hamas and which led to a crackdown on the group in the West Bank. Hamas denied being behind the killings. Israel has accepted a UN request for a 24-hour ceasefire in Gaza. However, Israel has warned the army will act if the pause is breached by Palestinian militants. A crisis cabinet meeting extended Saturday’s truce until midnight on Sunday. The move comes despite Hamas militants firing rockets after they rejected an earlier attempt to prolong the truce. Hamas said it would not accept a truce unless Israeli troops left Gaza and the displaced were allowed to return home. The Israeli military said a soldier was killed by a mortar shell fired from Gaza early on Sunday morning, bringing the death toll among its armed forces to 43. Two Israeli civilians and a Thai farm laborer working in Israel have also been killed in recent hostilities. The health ministry in Gaza says 1,033 Palestinians, mostly civilians, have been killed and about 5,900 wounded since Israel launched its Gaza offensive 19 days ago. Rocket sirens continued to sound across Israeli cities into Sunday. The Israel Defense Forces (IDF) said some 20 rockets had been launched toward Israel since Saturday night. 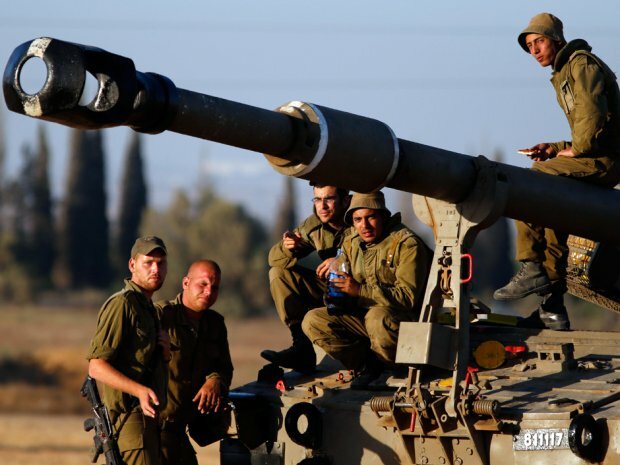 The military said three mortars had been fired from Gaza and hit Israel in the Eshkol region shortly after 20:00 local time on Saturday. Hamas’ armed wing, the Qassam Brigades, said they had fired a number of short- and longer-range missiles into Israel. The original truce expired at 20:00 local time on Saturday. 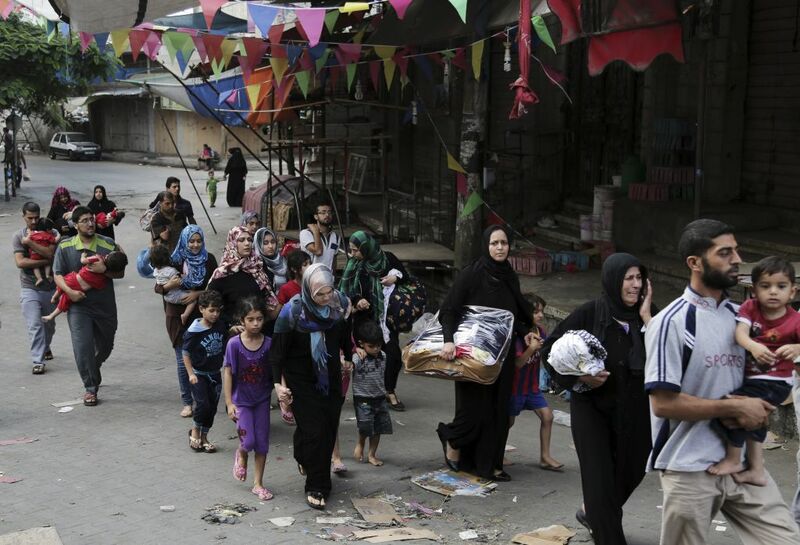 Gazans had been using the pause to recover bodies and gather supplies. 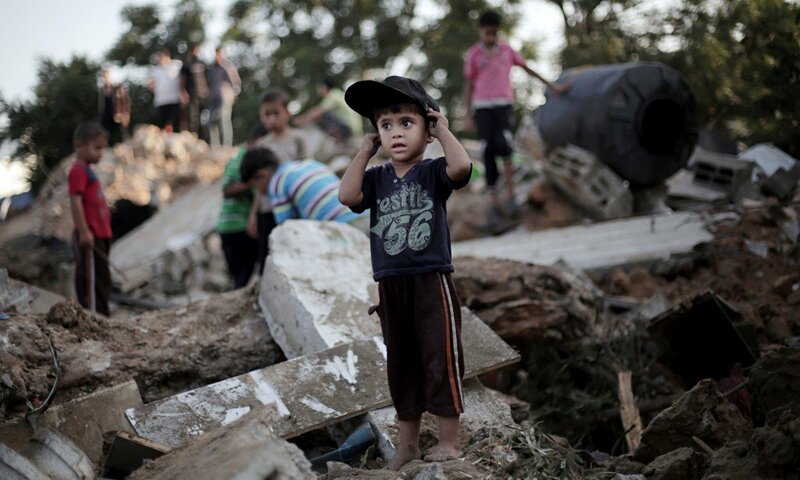 Gaza health ministry spokesman Ashraf al-Qidra said that almost 150 bodies had been found in the rubble on Saturday. After talks in Paris on Saturday, foreign ministers from the US, Turkey, Qatar and several European countries urged both sides to extend the truce. Israeli cabinet minister Gilad Erdan told Reuters on Saturday that a definitive deal looked remote, with no representatives from Israel, Egypt or the Palestinian Authority attending the Paris talks. Also on Saturday, pro-Palestinian demonstrations took place in several global capitals. Around 5,000 people rallied in Paris in defiance of a ban by the French authorities – about 50 people were arrested during clashes with police. Thousands also took part in a protest in London against Israel’s military campaign. Israel launched its military offensive with the declared objective of stopping Hamas firing rockets from Gaza into Israel. It also began a ground offensive on July 18, saying it was necessary to destroy tunnels dug by militants to infiltrate Israel. Israel and Hamas militant movement have accepted a 12-hour humanitarian ceasefire in Gaza. The truce is due to begin at 08:00 local time. Efforts to negotiate a seven-day ceasefire are still ongoing. Earlier US Secretary of State John Kerry said he was still confident of a longer ceasefire, despite media reports that Israel had rejected one proposal. More than 800 Palestinians, mostly civilians, and 38 Israelis have died since the conflict started on July 8. A spokesman for Hamas, the Islamist group that controls Gaza, Sami Abu Zuhri said there was “national consensus on a humanitarian truce… for 12 hours on Saturday”. The Israel Defense Forces (IDF) later confirmed the truce on Twitter, but said it would “continue to locate and neutralize terror tunnels”. “We will respond if terrorists choose to exploit this time to attack IDF personnel or fire at Israeli civilians,” it said in a statement. The news came shortly after Israeli Defense Minister Moshe Yaalon warned that ground operations in Gaza could soon be broadened “significantly”. Hamas has previously said it would not agree to any long-term truce that did not lead to an end to Israel’s blockade of the Gaza Strip. According to the UN, Israeli air strikes killed a further 68 people in Gaza on Friday, bringing the total number of Palestinian dead to about 870. There were also clashes during protests in the West Bank which left at least five Palestinians dead. Palestinians in the West Bank had been taking part in a “Day of Rage” against Israel’s military operation in the Gaza Strip. Meanwhile Israel’s military said its Iron Dome defense system had intercepted several rockets fired across the border by Hamas. Later it said that two of its soldiers had been killed in Gaza during the night. Israel launched its military offensive on July 8 with the declared objective of stopping Hamas firing rockets into Israel. It has since extended its operation to destroy tunnels dug by militants to infiltrate Israel. Several foreign ministers, including John Kerry, are due to hold a meeting in France on Saturday to seek a diplomatic solution. Israel has rejected a Gaza ceasefire proposal put forward by US Secretary of State John Kerry. Israeli Defense Minister Moshe Yaalon said ground operations in Gaza could soon be broadened “significantly”. John Kerry said he still hoped for an initial seven-day truce for next week’s Eid festival but there was “still some terminology… to work through”. He said he was confident Israeli PM Benjamin Netanyahu was committed to finding a solution. Israel and the Islamist group Hamas have been fighting for 18 days. Israel’s Channel 1 TV reported that the cabinet had unanimously rejected the truce proposal “as it stands”. More than 800 Palestinians, mostly civilians, and 36 Israelis have died since the start of the conflict. Hamas is yet to respond to the proposed ceasefire but its leader has already said the group will not agree to a deal without an end to Israel’s blockade of the Gaza Strip. Israeli airstrikes on Gaza continued on Friday. The Israel Defense Forces (IDF) said it had killed a senior member of the militant group Islamic Jihad. The IDF also said its Iron Dome defense system had intercepted several rockets fired across the border by Hamas. Rioting has erupted for the second night running at the Qalandia checkpoint in the West Bank, where 10,000 protesters massed on Thursday, clashing with Israeli border police. Calls for a ceasefire between Israel and Hamas movement are intensifying as more than 800 people have been killed in Gaza in the 18-day conflict. Secretary of State John Kerry has been in Cairo meeting Egypt’s foreign minister and the UN secretary general. Five Palestinians were killed in the West Bank, while one Israeli soldier was killed in northern Gaza. Activists called for a “day of rage” over the deaths of 800 Palestinians in Gaza. Israel has lost 36 people. Most of the Palestinian deaths have been civilians, while 34 of Israel’s dead have been soldiers. One Thai worker was also killed by rocket fire in Israel. Israel launched new air strikes on targets in Gaza on Friday, and said it had killed a senior member of militant group Islamic Jihad. 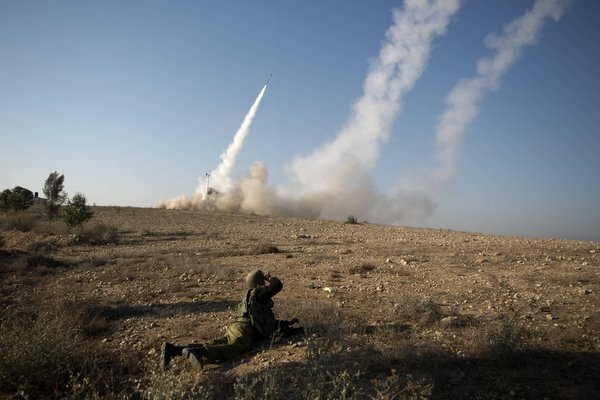 The Israeli military reported new rocket launches by militants inside the Gaza Strip, with several intercepted. Israel launched its military offensive on 8 July with the declared objective of stopping Hamas firing rockets into Israel, extending its operation since then to destroy tunnels dug by militants to infiltrate its territory. Hopes rose for at least a limited deal on Friday as it emerged that John Kerry, Egyptian Foreign Minister Sameh Shoukry and UN chief Ban Ki-moon were planning a news conference for later in the day. John Kerry is expected to leave the region on Friday, whether or not a deal is agreed. The plan is thought to include provision for a temporary pause in hostilities that could begin as soon as this weekend. Israel wants to keep its military in Gaza and continue disabling Hamas tunnels. Any plan must be approved both by Israel’s security cabinet and senior Hamas leaders, including Qatar-based Khaled Meshaal. At least two Palestinians have been killed and 200 wounded in the West Bank during protests against Israel’s campaign in Gaza, officials say. About 10,000 protesters marched from Ramallah towards East Jerusalem, where they were met by Israeli forces. At least 15 people died and scores were injured when an UN-run shelter came under fire in Gaza on Thursday. More than 800 Palestinians and 35 Israelis have died since the Israel-Hamas conflict began on July 8. 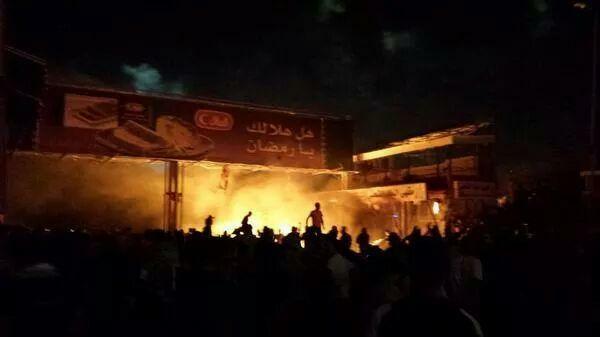 The protest at Qalandia, outside Ramallah, saw Israeli border police use “riot control measures” and live fire. Protesters also used live ammunition, Israel said. Large protests were also reported in Jerusalem on Thursday evening, after Israeli police prevented men under 50 from visiting the al-Aqsa mosque. At least 20 protesters were arrested after they threw rocks at police, Israeli police said. Israel launched its military offensive with the declared objective of stopping Hamas firing rockets into Israel. It has since discovered a network of tunnels used by militants to infiltrate Israeli territory, and has vowed to destroy them to restore security. Efforts to broker a ceasefire have been continuing despite the continued violence. Reports suggest a deal under discussion could allow Israeli forces to remain in Gaza to destroy tunnels. Palestinian leaders say this is the start of the “uprising of freedom and independence”. Thousands marched from the outskirts of Ramallah towards the Qalandia checkpoint calling for an end to the Israeli occupation. Youths threw stones and petrol bombs towards the checkpoint and tried to destroy the barrier. Israeli police say they used percussion bombs and tear gas. The demonstration was called for by a group of youths on Facebook, among them the son of the popular imprisoned Fatah leader Marwan Barghouti. Palestinian President Mahmoud Abbas has urged Palestinians to expand the protests, and leaders in the West Bank have called for a “day of anger” on Friday. 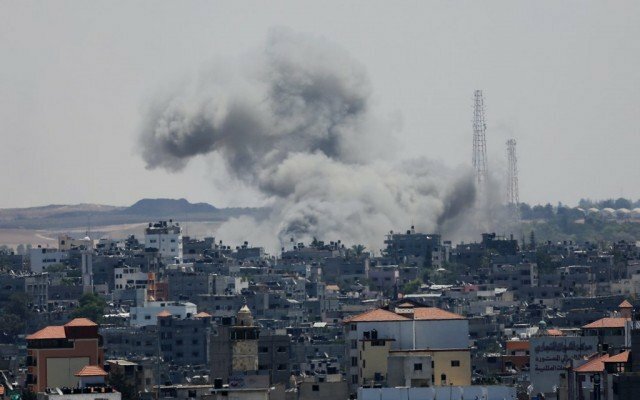 A UN shelter in northern Gaza was shelled on July 24, causing “multiple deaths and injuries,” according to a spokesman for the UN refugee agency. At least 15 people have been killed and more than 200 injured when a UN-run school used as a shelter in Beit Hanoun, Gaza, was shelled, the Gaza health ministry says. Hundreds of Palestinians were in the school in Beit Hanoun, fleeing heavy fighting in the area. It is the fourth time that a UN facility has been hit in Israel’s offensive against Hamas militants. In the past 16 days of fighting, more than 750 Palestinians and 32 Israelis have been killed, officials say. Israel launched its military offensive on July 8 with the declared objective of stopping Hamas firing rockets from Gaza. Earlier on Thursday, UN humanitarian chief Valerie Amos said that it was “vital” to have a ceasefire. “We have over 118,000 people now who are sheltering in UN schools… people are running out of food. Water is also a serious concern,” she said. She said the conflict meant 44% of Gaza was a no-go area for Palestinians, and residents were running out of food. Israel’s Prime Minister Benjamin Netanyahu said on Thursday he regretted each Palestinian civilian death, but said they were “the responsibility of Hamas”. Correspondents say pools of blood lay on the ground in the courtyard of the school in Beit Hanoun in northern Gaza. There was a large scorch mark where it appeared a shell had hit, the Associated Press news agency reports. UN officials said that during the course of the day they had been trying to negotiate a window of time with the Israeli army for civilians to leave the area because of the heaving fighting. Chris Gunness, a spokesman for the UN Relief and Works Agency for Palestine refugees (UNRWA), said it was never granted. He said the Israeli army had been formally given the co-ordinates of the shelter in Beit Hanoun. There has been no comment so far from the Israeli military. Casualties from the attack have been taken to several local hospitals. 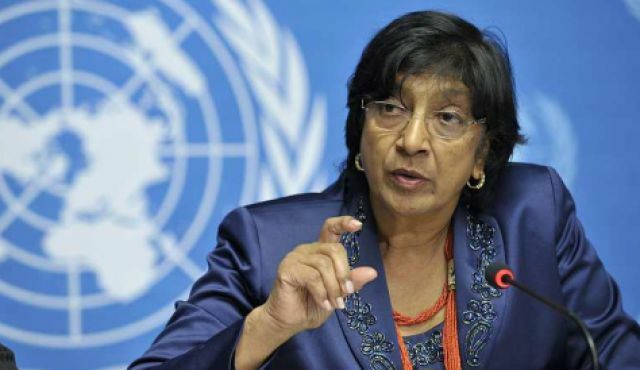 UN High Commissioner for Human Rights Navi Pillay has condemned Israel’s military actions in the Gaza Strip, saying that war crimes may have been committed. Navi Pillay told an emergency debate at the UN Human Rights Council in Geneva that Israel’s military offensive had not done enough to protect civilians. She also condemned Hamas for “indiscriminate attacks” on Israel. Israel launched its offensive on July 8 with the declared objective of stopping rocket fire from Gaza. “There seems to be a strong possibility that international law has been violated, in a manner that could amount to war crimes,” Navi Pillay said. Israel’s Justice Minister Tzipi Livni described the UN Human Rights Council as an “anti-Israel” body, Reuters news agency reported. A foreign worker in southern Israel was also killed by a rocket fired from Gaza on Wednesday, police said. The UN says about 74% of those killed in Gaza are civilians, with medical clinics among the facilities hit by air strikes. “Civilians in Gaza have no safe place to go as 44% of the land has been declared a ‘no-go zone’ by the Israeli army,” the assistant secretary-general at the UN Office for the Coordination of Humanitarian Affairs said. There was heavy fighting in the town of Khan Younis in the southern Gaza Strip on Wednesday. Eyewitnesses say around 5,000 Palestinians, some waving white flags, are fleeing in a state of panic following a ground incursion by Israeli troops. Meanwhile US Secretary of State John Kerry arrived in Israel on Wednesday to try to help negotiate a truce. “We have certainly made some steps forward. There is still work to be done,” John Kerry said shortly after arriving. John Kerry flew by military plane to Ben Gurion airport near Tel Aviv, as several US and European airlines continue to suspend civilian flights into Israel after a rocket from Gaza landed near the airport. German airline Lufthansa announced on Wednesday it would extend the ban for another 24 hours. At least five people died in an air strike in Khan Younis overnight. An Israeli soldier was also killed. 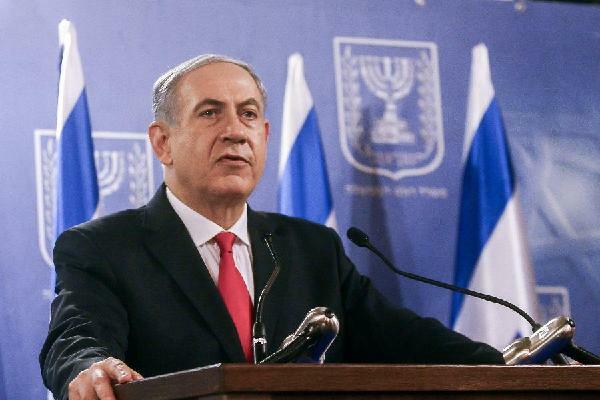 Earlier, Israeli PM Benjamin Netanyahu said Hamas should be held accountable for rejecting an Egyptian ceasefire proposal. Referring to a July 16 Israeli air strike that killed children playing on a beach in Gaza, Navi Pillay said “the disregard for international humanitarian law and for the right to life was shockingly evident”. She also condemned rocket attacks from Gaza into Israel. “The principles of distinction and precaution are clearly not being observed during such indiscriminate attacks on civilian areas by Hamas and other armed Palestinian groups,” she told the UN Human Rights Council. Despite her condemnation of Hamas attacks on Israel, Navi Pillay clearly views Israel’s actions in Gaza as disproportionate. “Israel is acting according to international law,” Tzipi Livni said. 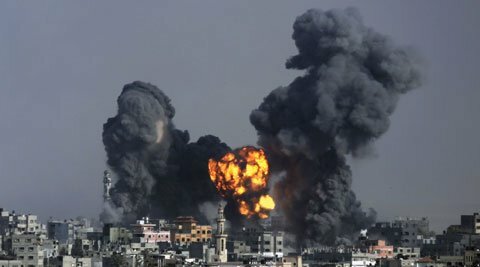 A 2009 UN human rights report said that Israel’s military and Hamas had each committed potential war crimes during Israel’s 2008-2009 offensive in Gaza. The Goldstone report was rejected by Israel and the US as biased and flawed. John Kerry appeared to criticize Israel in candid remarks caught on an open microphone between television interviews Sunday. The secretary of state was heard talking about Israeli soldiers killed in Gaza to a State Department official identified as Jonathan Finer just before appearing on the Fox News Sunday political talk show. “I hope they don’t think that’s an invitation to go do more,” John Kerry says. A frustrated John Kerry then says: “It’s a hell of a pinpoint operation, it’s a hell of a pinpoint operation,” in apparent frustration over the civilian toll in the Israeli operation. The Palestinian death toll topped 500 on Sunday as Israel pressed a ground offensive into the densely packed Gaza Strip after two weeks of aerial attacks. “We’ve got to get over there,” John Kerry is heard saying on the Sunday recording. When confronted over the remarks by Fox host Chris Wallace, John Kerry reiterated Israel’s right to self-defense. “I think it’s very, very difficult in these situations, obviously very difficult,” he said. “You have people who’ve come out of tunnels. You have a right to go in and take out those tunnels. We completely support that. And we support Israel’s right to defend itself against rockets that are continuing to come in. Hamas has started this process of rocketing, after Israel was trying to find the people who killed three young – you know, one American kid, three young Israeli citizens. It’s disgraceful,” John Kerry said. “It’s tough to have this kind of operation. I reacted obviously in a way that … anybody does with respect to young children and civilians. “But war is tough, and I’ve said that publicly and I’ve said it again. We defend Israel’s right to do what it is doing in order to get at those tunnels,” John Kerry said. John Kerry traveled to Cairo early Monday for crisis talks on Gaza, following President Barack Obama’s call for an “immediate ceasefire” between Israelis and Palestinians in the conflict. American citizens Max Steinberg and Nissim Sean Carmeli were killed on Sunday during fighting between Israel and Palestinian militants in the Gaza Strip, US officials say. 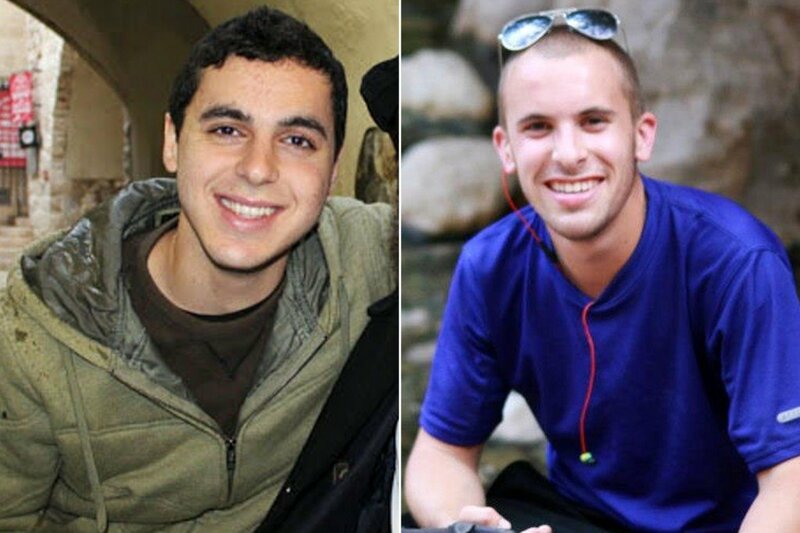 Max Steinberg, 24, and Nissim Sean Carmeli, 21, were fighting for the Israel Defense Forces (IDF). They were among 13 Israeli soldiers killed on Sunday. More than 100 Palestinians were also killed on Sunday. 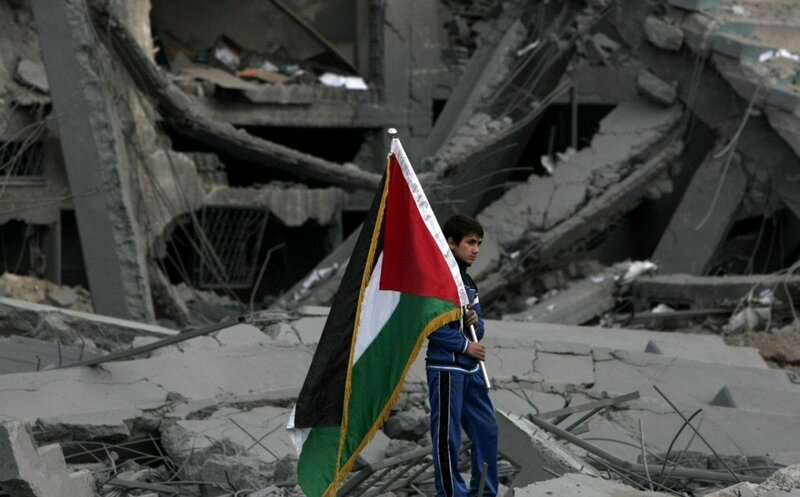 The UN Security Council has called for an immediate ceasefire in Gaza. “We can confirm the deaths of US citizens Max Steinberg and Sean Carmeli in Gaza,” state department spokeswoman Jen Psaki said on Sunday, declining to provide further details. Max Steinberg, who hailed from California, was reportedly a sharpshooter for the Golani Brigade, the Associated Press news agency reports. “He was completely dedicated and committed to serving the country of Israel,” his father, Stuart Steinberg, told the AP. Sean Carmeli was a sergeant from Texas who moved to Israel four years before. More than 500 Palestinians, mainly civilians, have been killed since the Israeli offensive began 13 days ago, Gaza’s health ministry says. Meanwhile, Hamas launched fresh rocket attacks and used tunnels to infiltrate Israel near the town of Sderot. All 10 intruders were killed, Israel said. Twenty Israelis – 18 of them soldiers – have died, Israel says, as it seeks to end rocket fire from Gaza. The UN Security Council has called for an immediate ceasefire in Gaza Strip as the number of Palestinians killed during Israel’s military operation passes 500. 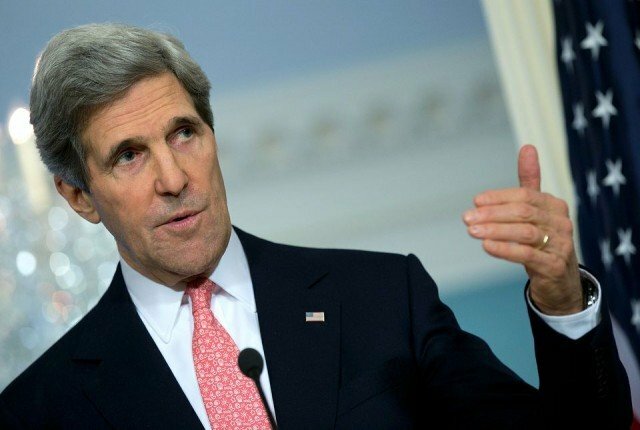 It comes as US Secretary of State John Kerry heads to Cairo for talks on the crisis amid a mounting death toll. Over 500 Palestinians, mainly civilians, have been killed since the Israeli offensive began two weeks ago, Gaza’s health ministry says. Twenty Israelis – 18 of them soldiers – have died, Israel says, as it seeks to end rocket fire on the country. On Sunday, Gaza saw its deadliest day since the start of Israel’s Operation Protective Edge, with 13 Israeli soldiers and more than 100 Palestinians killed. Israel says it has killed at least 120 militants since the ground offensive began on Thursday night. Sunday’s late-night UN Security Council session was convened at the request of Jordan, which is understood to have proposed a strongly worded draft resolution for consideration. Secretary General Ban Ki-moon spoke out on the situation, describing Israel’s operation in Shejaiya as “an atrocious action”. However, the 15-member council instead issued a statement to the press, with Rwanda’s UN ambassador calling for “an immediate cessation of hostilities”. Eugene Gasana said members voiced alarm at the escalation of violence during a “sobering session”. More than 60 Palestinians alone were killed during heavy shelling in Shejaiya, in what Palestinian President Mahmoud Abbas called “a massacre”. Israeli PM Benjamin Netanyahu vowed to continue operations “as much as we need to” despite the number of Israeli soldiers killed rising to 18 at the weekend. Two of the soldiers killed were American citizens, US state department spokesperson Jen Psaki said. Sunday’s death toll for Israel’s military is higher than that sustained during the entire three-week duration of Operation Cast Lead in 2008-2009, the last time Israel sent troops into Gaza. Hamas said on Sunday evening that it had captured a member of the Israel Defense Forces (IDF), prompting celebrations on the streets of Gaza and West Bank. However Israel’s UN ambassador Ron Prosor denied the claim, saying “those rumors are untrue”. The UN says 83,695 people have now been displaced in Gaza and that the figure is “rising all the time”. Israel announces it has expanded its ground offensive in Gaza, with residents reporting the heaviest shelling since the conflict began 13 days ago. In a statement, Israel’s military said “additional forces” had joined “the effort to combat terror” in Gaza. Four Palestinians died, including two children and the son of a senior Hamas official, in new airstrikes on Sunday, July 19. UN Secretary General Ban Ki-moon is due to arrive in Qatar later to meet Palestinian President Mahmoud Abbas. Ban Ki-moon’s visit is part of a regional tour aimed at helping Israelis and Palestinians “end the violence and find a way forward”, the UN said. The death toll continued to rise at the weekend, with the number of Palestinians killed now at more than 350 – the vast majority of them civilians. Five Israeli soldiers and two Israeli civilians have died since PM Benjamin Netanyahu launched the military offensive on July 8. 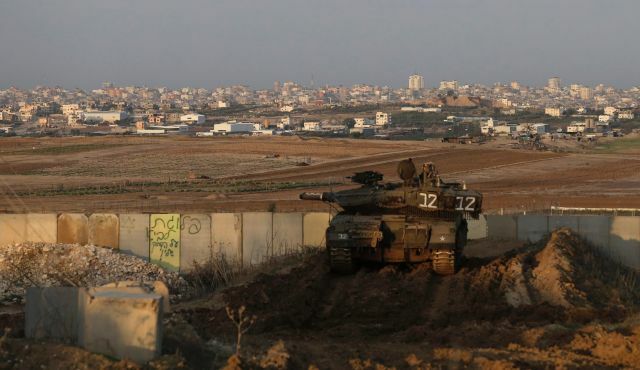 The Israel Defense Forces (IDF) sent ground troops into Gaza on Thursday after 10 days of heavy air and naval barrages failed to stop rocket fire from Gaza. Israel says the ground operation is necessary to target a Hamas tunnel network, which it says it could not do only from the air. Lieutenant Colonel Peter Lerner, an IDF spokesman, said the ground offensive was being expanded “to restore security and stability to Israel’s residents and citizens”. Residents in Gaza reported hearing explosions throughout the night on Saturday. An airstrike in the suburb of Shejaiya targeted the house of Hamas official Khalil al-Hayya, killing four people including his son and daughter-in-law, Palestinian doctors said. Meanwhile, the UN warned that it was running out of supplies to help more than 50,000 Palestinians who have sought shelter at its schools in Gaza. A UN official said the number of people fleeing was much higher than expected, with both the Israeli and Egyptian borders closed to Gazans. Diplomatic efforts to secure a ceasefire involving, among others, Egypt, Qatar, France and the UN, have failed to make any progress. French Foreign Minister Laurent Fabius met Benjamin Netanyahu on Saturday, but said that attempts to agree a ceasefire had failed. “Sadly I can say that the call for a ceasefire has not been heard, and on the contrary, there’s a risk of more civilian casualties that worries us,” he told press. Qatar is expected to host a meeting between President Abbas and Ban Ki-moon on Sunday before the UN chief continues on to Kuwait, Egypt, Israel, the Palestinian Territories and Jordan. Mahmoud Abbas is also due to meet Hamas leader Khaled Meshaal in a bid to convince the Islamist group to agree to Egyptian efforts to end the fighting. Palestinian PM Salam Fayyad has resigned, after a long-running dispute with President Mahmoud Abbas. 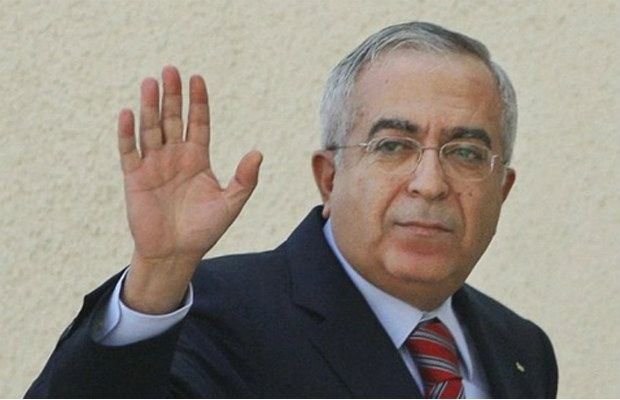 Official Palestinian news agency Wafa said Mahmoud Abbas accepted Salam Fayyad’s resignation after they met in person. The president asked him to remain as caretaker until a new government is formed. Salam Fayyad’s resignation is a major blow for US efforts to restart the long-stalled peace process with Israel. His resignation is the climax of long-running and increasingly bitter dispute between the prime minister and the president. They have been at odds over economic policy since Finance Minister Nabil Kassis quit last month, and rumors were rife that Salam Fayyad would step down. Salam Fayyad accepted Nabil Kassis’s resignation, but he was subsequently overruled by Mahmoud Abbas, challenging his authority. Mahmoud Abbas reportedly waited several days before accepting Salam Fayyad’s resignation. It comes despite recent attempts by US Secretary of State John Kerry to reconcile the two men. Salam Fayyad, 61, was seen as a key person in US attempts to restart peace negotiations with Israel. Mahmoud Abbas may now struggle to replace him with someone who can match his level of international credibility. He is expected to name a new prime minister within days. Salam Fayyad has been prime minister of the Palestinian Authority since 2007. A former IMF official, he is widely respected among international organizations and donors. He is considered a liberal and politically independent, being a member of neither Mahmoud Abbas’s Fatah party, nor of rivals Hamas, who control the Gaza Strip. In recent months Salam Fayyad has proved unpopular with both parties, partly due to his economic policies at a time when the Palestinian Authority is in financial crisis. Hamas welcomed Salam Fayyad’s decision to stand down. Spokesman Fawzi Barhoum said he and his government “worked to protect the Zionist occupation and US interests”.